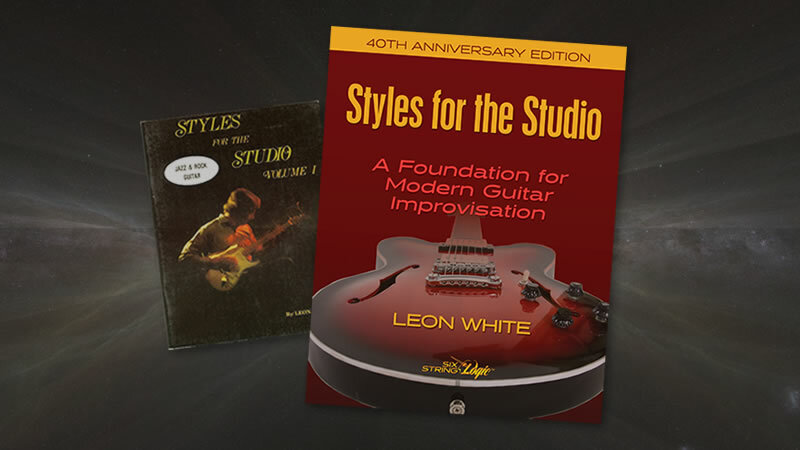 Los Angeles, CA – June 14, 2016 – (GuitarPR) – Six String Logic, LLC has announced the release of a special 40th Anniversary Edition of the highly acclaimed guitar book, Styles for the Studio by Leon White. First published in 1976, the book has been used by thousands of guitarists at all levels to rave reviews. Since going out of print several years ago, copies of the book have routinely shown up on eBay for $50-$100 and even higher. The 40th Anniversary Edition has been completely updated by the original author with new material, bigger images and now includes over 100 backing tracks for use with the examples in the book, as well as 12 concise videos and extensive reference materials. With interest in the book at a high level, Six String Logic is bringing it back and offering the first 250 purchasers 20% off with promo code: 4STYLES20. The book is shipped in paperback hard copy while the backing tracks, videos and reference materials are immediately available via digital download. This allows the purchaser to become familiar with the structure and organization in time for the book’s arrival in a few days. Styles for the Studio, 40th Anniversary Edition is available direct at http://stylesforthestudio.com. Additional dialog can be found on their Facebook page at https://facebook.com/stylesforthestudio.